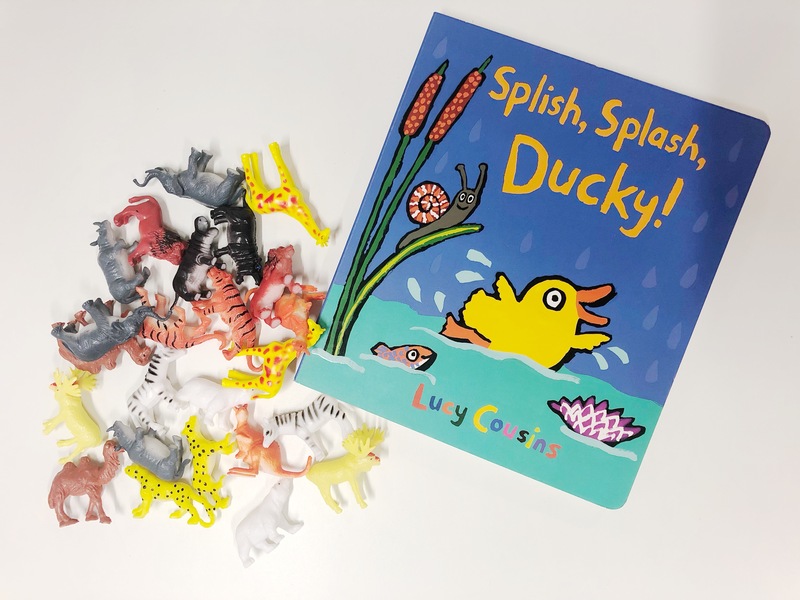 Highlighting Verbs: Splish Splash Ducky is jam packed with different action words (verbs) which are incredibly important for language and sentence development (all sentences need verbs!). What I really like about Splish Splash Ducky is that the types of verbs are relevant to babies and toddlers (hug, look, hop, squirm, play, swim, shake, hide). You can bring these verbs to life by doing the action, repeating them, making the book hop/squirm/shake or by emphasising them when you read the story. Language Modelling: Each page of Splish Splash Ducky provides an opportunity to use rich descriptive language and vocabulary that you may not use in your everyday interactions. The frog is clearly jumping with glee and ducky is soaring after him, the flowers are swaying in the wind, the fish in the corner might be feeling shy, the signets are flapping their wings with excitement, the mouse is peeking out from under the leaf, ducky looks disappointed when the rain stops”. Remember that we need to model rich language in order for children to understand and develop this language in their own vocabularies, even if we do not expect them to say it straight away! Remember that it doesn’t matter at all if you don’t finish the story. The aim is not to get to the end, but to share the experience and be in the same listening and learning space as your child along the way. I’d highly recommend Splish Splash Ducky and I’ve no doubt it will become a fast favourite for young children and parents alike. Thanks to Walker Books Australia for donating children’s books to enrich our reading resources with our children.